Those of you in the corporate world or who run your own business are very familiar with this time of year. It’s about budgets and projections and performance to plan. It’s about numbers and financials and meeting bank covenants. Those items might be interesting to financial gurus and CFOs, but what about our customers? What about the beer geeks? They don’t care if we hit plan or make our budget; they care that our beer is above reproach and that our brand remains authentic. Trademarks – too many breweries and too few names? 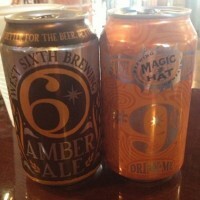 Recently there was a bit of industry press about the trademark dispute between West Sixth Brewing in Lexington, KY and Magic Hat Brewing from Burlington, VT. The first I read of the dispute was this info on the West Sixth webpage. My original reaction was to wonder what the heck was wrong with Magic Hat. But then I read the Magic Hat response here and I felt misled by both parties. And I have to say, when I see the two items below, I could easily think they are from the same company. I mean why not make both the 6 beer and the 9 beer? 6 and 9 go together like……. well, you know. I am thankful for all the people involved in Terrapin Beer Company, both here today and those from the past. Yes, we have really great employees. But this also applies to our suppliers, distributors, retailers, and customers; so many amazing people I have met at one time or another. If it were not for each and every one of you, Terrapin would not be where we are today. I am thankful for everyone else involved in the craft beer industry. A rising tide really does lift all boats. Other local breweries are not our competition. There are now over 2,100 breweries in the US and we only account for 6-7% of the beer being sold. We are working together to promote better beer. And it is working! To those of you who have plans to open a brewery in Athens or elsewhere in Georgia: GO FOR IT! I am here to help if you need it; don’t be afraid to call and ask for advice. Last, but by no means least, I am thankful for the people of Athens who have stood by Spike and I as we have built this crazy dream of ours into something starting to resemble a real business. There have been some crazy twists along the way, and I’m sure there will be more in the future. Even now, after all these years, we are still learning as we go. Athens, we could not have done it without you. Thank you for everything.